Anyone who wants to become a Notary must pass a background check. There are screening regulations that vary by state and others that are standard nationwide. For example, to become a Notary you cannot have a felony conviction for a crime that involves moral turpitude. Backgrounds Online is a leader in the Notary screening industry. We'll help you develop a screening package that is compliant with federal and state laws anywhere in the U.S. In addition to the initial background check, existing Notaries should undergo annual screenings to determine whether or not they remain eligible for employment. Backgrounds Online offers annual Notary screening services that are fast and easy to complete. Our team will send out advance notifications that inform each person it is time for their annual screening. Notaries must then confirm and give their consent. Once that is complete, the screening process can begin. We provide annual screenings for Notaries that search for more than 100 possible offenses. Each offense has a set point value. Some, such as traffic violations, incur a small number of points. Larger violations produce more. Once all offenses are scored, a final value is assigned. Backgrounds Online can adjudicate the results, if necessary, but we do not establish or update the scoring process. Backgrounds Online provides annual screenings with a Pass or Fail grade for Notaries. We search for more than 100 possible offenses. Each offense has a numeric value that contributes to a final score. Scores of 25 or more are automatic fails. To set up annual Notary screenings, please contact us. 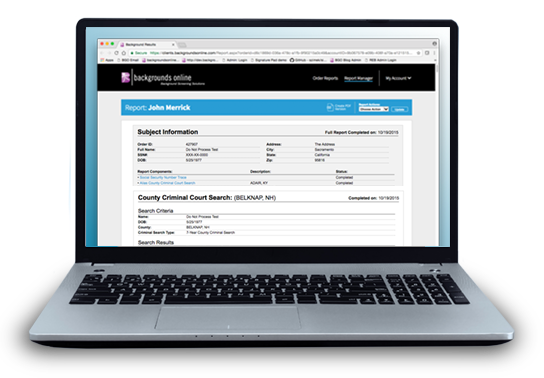 Backgrounds Online is fully compliant with all FCRA regulations and Signing Professionals Workgroup (SPW) background screening standards. The SPW recommends annual screenings for various reasons, including the fact that Notaries may have access to confidential information, and their jobs often require them to spend time in various offices and private residences. Whether you are screening potential Notaries, or someone who has been in the business for years, it is essential to ensure complete compliance with all regulations. Backgrounds Online has trained screening professionals who keep up with new and existing rules that govern this industry. Do you offer a pass/fail screening for Notaries? A: Yes. Backgrounds Online conducts a thorough background check each year, and assigns specific point values to anything found on the person's record. Minor items, such as a traffic violation, have a small number of points. Larger issues, such as a criminal conviction, incur a large number of points. Once the background check is finished, the points are tallied and the Notary is assigned a Pass or Fail result. Will Notaries need to do anything prior to their annual screening? A: Yes – Notaries must provide consent and authorize a screening each year. Will you notify Notaries if they pass or fail? A: Yes, we provide notification. If a Notary passes, we will inform them via email. And if a Notary fails, we inform them via email and regular mail. We do not provide specific details about scores or points incurred. Due to the nature of their work, Notaries are held to personal and professional standards. Backgrounds Online has the knowledge and experience to screen Notaries and ensure they maintain eligibility.